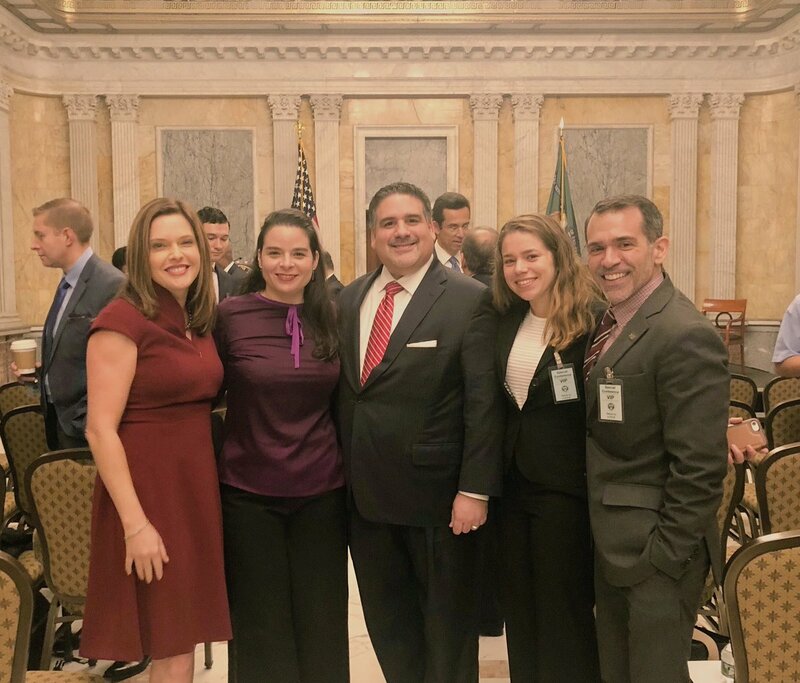 At the U.S. Treasury’s Hispanic Leadership forum (from left to right): Alumna Mercedes Schlapp ’94, White House director of Strategic Communications; Neri Martinez, executive director of the Republican State Leadership Committee’s Future Majority Project; Eliot Pedrosa; Lianna Farnesi ’18, intern at The Heritage Foundation; and Carlos A. Becerra ’98 ’01, assistant vice president of FIU’s Governmental Relations. As the top U.S. representative to the Inter-American Development Bank in Washington, D.C., FIU alumnus Eliot Pedrosa has a hand in deciding which projects the organization will fund to improve lives in Latin America and the Caribbean. Pedrosa, a graduate of the Steven J. Green School of International and Public Affairs and former chairman of the school’s Dean’s Advisory Council, said he owes his success to his family – and his time at FIU. President Donald Trump nominated Pedrosa to his post as alternate executive director of the IADB last year. He was confirmed by the U.S. Senate in May 2018. Through financial aid and technical support, IADB helps improve health, education and infrastructure. Last year, the IADB approved nearly $15 billion in grants and loans to build infrastructure, create jobs, improve healthcare and education, reduce poverty, fight corruption, and help meet the challenges presented by natural disasters, changes in climate and fluctuations in markets. “It’s my job to be the United States’ voice and to cast its vote on the lending that the bank’s management proposes to support economic development in Latin America and the Caribbean,” Pedrosa explained. Pedrosa, who previously led the Miami litigation department of Greenberg, Traurig, LLP, said the education he received at FIU and the relationships he made at the university have been foundational to his career, which includes more than 18 years representing clients in legal matters throughout the Americas. “I have seen first-hand some of the challenges they face,” he said in his testimony before the Senate Foreign Relations Committee. Pedrosa, whose parents fled communism in Cuba for a better life in the United States, said his inspiration stems from seeing others pursue their dreams. Pedrosa wants students who may be struggling to know that they are not alone. “We all have times when we struggle, and that’s when we need our support systems the most,” he said. “It could be a parent or a spouse. It could be a friend or a co-worker. It could be a mentor, a professor or an advisor. But don’t be afraid to lean on your support. They will get you through, and before long, you’ll be in a position either to repay the favor or to pay it forward. “Dream big, work hard and repeat,” he said.